Today I am sharing this great giveaway that is not only classic, but also luxurious. 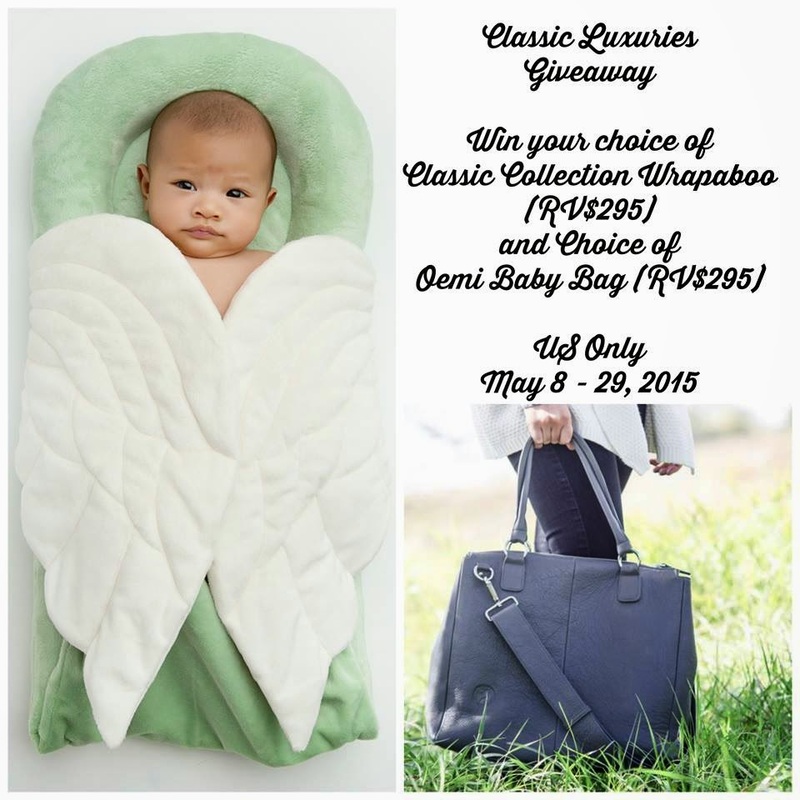 Today one of you will win an Angels on my Pillow Classic Collection Wrapaboo in your choice of color ( RV $295) and an Oemi Baby Bag in your choice of color (Grey or Brown RV $295). It's why we call it luxury. I would love the Icelantic Blue Baby Bag. I would choose the gray diaper bag and a wrapaboo in denim and white!! Such a great prize thanks so much!! id love icelandic blue and the brown bag! this is great! so gifty! I would choose the grey bag and the white & white with linen tote wrapaboo! I like the ivory wrapaboo along with the brown bag. I think I would choose the gray bag and the ivory Wrapaboo. I would pick the Trend Collection" Wrapaboo™ in Tiffany & White and the Oemi bag in the original brown color. I would pick the ivory Wrapaboo and gray bag! i would pick the Buttercup & Ivory wrapaboo and the oemi bag in the brown color. I like the grey bag and denim and white wrap. If I won I would pick the Tiffany & White Wrapaboo and the Oemi Bag in Gray. I like the wrapaboo in tiffany and white. For the bag, I like the brown. I would choose tiffany&white wrapaboo and brown for the bag! I would choose the Wrapaboo in Denim & White and the grey Oemi Baby. I like the buttercup wraparoo and the grey bag. I like green for the wrapaboo and grey for the bag. Honestly I wouldn't really care, they're amazing products! I would love the icelandic blue and the brown bag! This is a great giveaway! Spa blue & Ivory and the grey bag. That's hard to choose! I think I would choose ivory/ivory or denim/ivory for the Wrapaboo and the chestnut color for the Oemi bag. I like the mint & ivory Wrapaboo and I like the brown leather bag. I would go with a gender neutral color, probably the green or ivory. And the bag, probably the brown one.